Labeling your fear of public speaking as a social anxiety disorder does not make it a bigger deal than it is. That’s just a term used in scientific journals to unify the language. It does not mean it’s bad or good; it just means that it’s not an ideal to have and with proper knowledge and training you can overcome it. It’s important to know the facts and separate from all the fiction so that you can start healing and improving right away. 7% of the US population is a big number; that’s about 27 million Americans! There are more negative effects like contribution to general anxiety and depression which I address in a different article. How many seek professional help? 7- Only 8% of those who have public speaking fear seek professional help despite the documented negative impact on career and wages. Only 8% of those who have public speaking fear seek professional help despite a proven negative impact on career and wages. *** Not all the stats on public speaking and social anxiety vary for many reasons, I am presenting conservative numbers for reference. Fake public speaking fear stats (beware). There is a number floating out on the web stating that 75% of the population have speech anxiety. I have to admit, that I used that number at some point. But coming from an engineering background, I wanted a source to verify the information and I could not find it. That’s what started me on the quest to look into this and provide accurate data. The 75% number is not a verified number and if I ever find the source I will update the blog article. 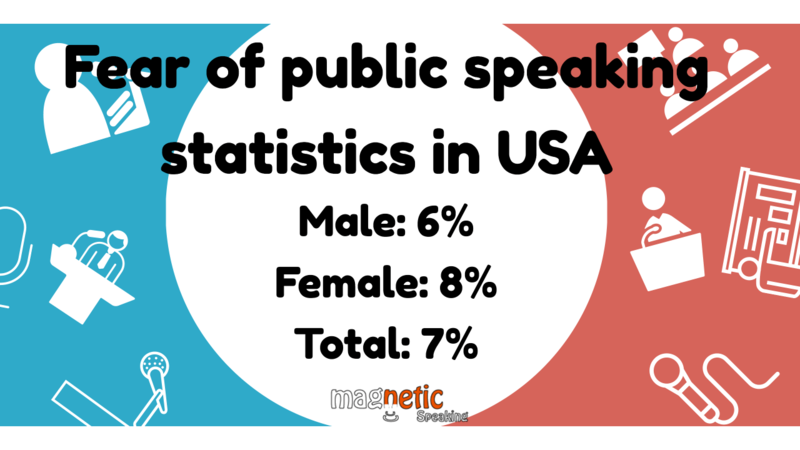 However, from my research, I found that public speaking fear stats are less than that. Since public speaking fear is one form of social anxiety disorder we have to look into social anxiety disorder stats first. First, what is Social Anxiety Disorder? According to the Social Anxiety Institute, Social anxiety disorder is also called Social Phobia. From the definition, you can see how public speaking fits in the category, so does musical performances, acting in theater, or even giving a toast at a party. Here are the stats for SAD USA. The source of these statistics is the “Social phobia in the general population: prevalence and sociodemographic profile” published in the journal of Social Psychiatry and Psychiatric Epidemiology. Note, there are variations between male and female and country to country. When I dug into the numbers, I found that there are variations between individual states in the USA and I only chose to present the overall average. There are also variations between countries, just for the interest in information, below are the numbers for Sweden. As you can tell, there are differences in numbers between males, females and even countries. Please look into your country of origin and share in the comments below. I am sure that would be interesting. Public speaking is the largest form of social anxiety. Faravelli et al. (2000) found that 89.4% of patients with social anxiety disorder had a fear of public speaking. With Glossophobia or fear of public speaking as a major part of SAD, we can infer more stats about the implication for the sufferers. Here are few. According to a publication by Columbia University, social phobia has a dampening effect on several aspects of career and life. Social phobia has a 10% impairment on your wages (you get paid 10% less than others). And a 10% impairment on your graduation rate from college ( you have 10% less chance of graduating college) and a 15% impairment on your ability to obtain a managerial and leadership positions at your company (you have 15% less chance of getting into a professional or managerial position). If you have SAD, it’s holding you back, and it does not have to. Because public speaking fear is a large subset of social phobia, we can use the same numbers to approximate the negative impact of public speaking anxiety on individuals. I suffered from social phobia and public speaking anxiety for most of my life. I struggled with it and found a way out. I know you can too. It saddens me most when I look at the research and see that only 8% of people suffering from social anxiety or public speaking fear seek professional help. There are many therapies available to you so that you don’t end up a statistic. I did and still do many things to keep growing and improving my public speaking confidence and ability (and my social confidence). Fifteen years ago I was an introverted, socially awkward engineer and I knew that my career freedom rests on my ability to free myself from my anxieties. I took acting classes, improvisation, standup company while getting traditional and nontraditional help to reduce my fears. Not to brag, but now and despite all odds, I am a national speaker and author now, and I run the most advanced public speaking training company in the Silicon Valley tailoring training for smart professionals and executives just like you. I hope you got some real research on the fear of public speaking statistics. That was my primary objective. Also, I hope you got some statistical data on the impact of not doing anything about your fear. Finally, it is my hope you got some ideas on freeing yourself of both fears of public speaking and social anxiety.